As you may now I am a big fan of the various Milt Caniff imitators and would love to do a book about them. The hardest part seems to be to get together a good set of stories from Mel Graff's Secret Agent X-9. 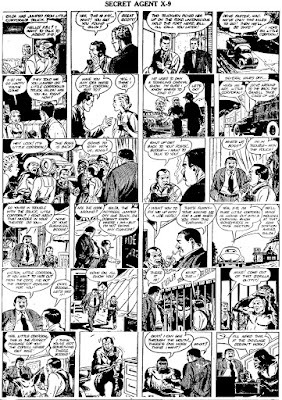 Graff took over the series in the early forties, leaving Scorchy Smith to the artist he would be compared to for the rest of his life, Frank Robbins. 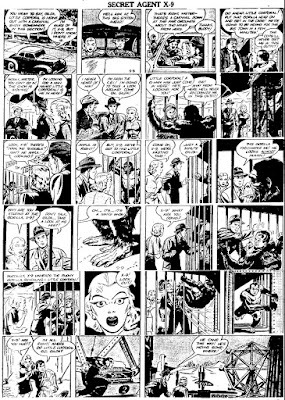 At first his -9 was very much in the Caniff tradition, but through the years he started adding his own touches. In this cross section of his run, you can see his style evolve. A major part of it was when he started using zip-a-tone or krafttint paper somewhere in 1947. In the mid fifties the most typical features of his work were the open or oddly shaped panels he used and the snow scenes in many of his stories. Somewhere in 1960 he left the strip, leaving it to Bob Lubbers, who continued it as Bob Lewis. When the switch actually took place I cannot tell. I have added a couple of very small strips from January 1960 that seem to be by Graff but are unsigned. They may already be by Lubbers, imitation Graff. If so, he must have done them immediately after pinch hitting for a couple of months on The Saint (where he was followed first by Greg Fleissel and later, signed, by Doug Wildey. While at the same time continuing the Sunday and daily strips of his own series Long Sam. The clips come from various sources to the quality differs. Ger: This is great stuff - from your extensive research, however, it would seem that a book that adequately treats of all or most Caniff imitators would have to be enormous - what about the idea of a volume that focuses on one strip or artist as a "par excellent" example of imitative of Caniff, with, however, added "sidebar" comparison samples from other Caniff-influenced artists and their strips (newspaper or comic book), which samples would be included partly according to their availability? Would it be possible to choose from a number of candidates that could qualify as the "par excellent" example, with the likely candidate being determined in part by the following criteria: (a) being interesting enough as an artist and an artist's work to justify being the focus of a book on its own; (b) being able to find enough extant samples of that artist and/or his or her strips for reprinting in a somewhat extensive way; and (c) there would not be any problematic copyright issues? I wonder if there exists such a candidate. As you know I'm a Graff fan, especially of his earlier work. I've long been frustrated trying to sort out his relationship to Paul Norris. Norris said on several occasions that he ghosted frequently for Graff. In one article (don't recall where) he said he produced one fully story a year, writing and drawing, to make up for Graff's slow production, due, reportedly, to Graff's alcoholism. 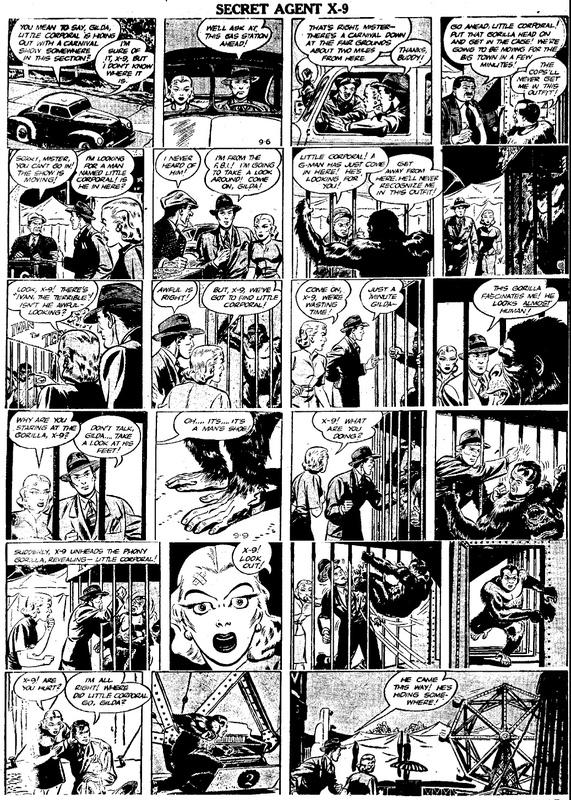 Norris was the KFS in-house pinch-hitter, and it's almost always easy to pick out his work on strips like Flash Gordon. His style (of which I'm not fond) was so strong it showed through no matter how hard he tried to imitate another artist's style. Secret Agent X-9 has been the exception. With the passing years Graff developed a mannered way of drawing heads which had much in common with Norris' vertical-rectangle heads. Consequently I've wondered whether some of the work signed Graff was actually drawn by Norris. Seeing all these strips together I think I may have been mistaken. 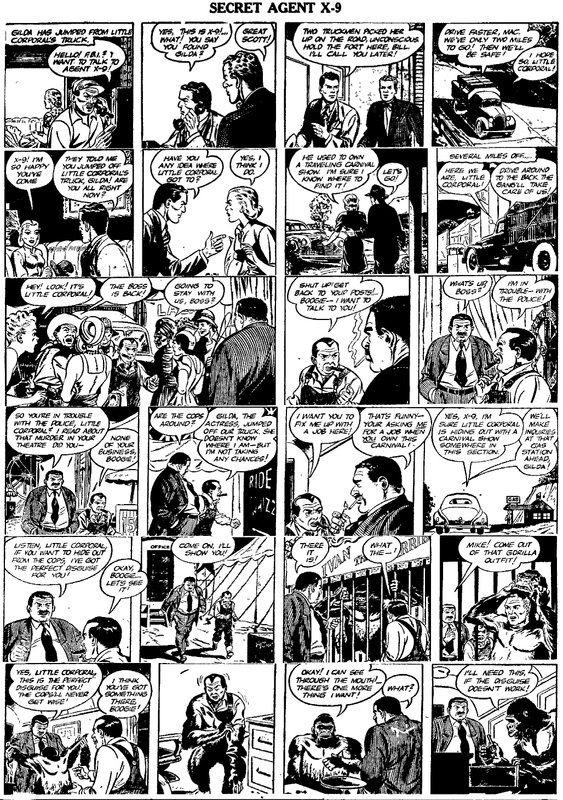 While strips like 5-26-1952 show the Norris-style heads, unsigned strips like 3-14-1959 and the sequence beginning 1-1-1960 are so obviously Norris that I speculate this was one of Norris's catch-up stories, and that Graff really did draw the strips he signed. Missing from the 1960 story is the use of heavy blacks which Graff used to separate foreground from background. Present in he 1960 story are Norris's characteristic stiff, angular figures, which I don't see in the signed strips. I also notice that the lettering on the unsigned strips differs from the signed ones. The lettering on Gaff's signed strips is consistent through most of his run on X-9, and it followed Graff to Captain Easy when MG was ghosting the Sundays. From this I gather Graff lettered his own strips and his characteristic lettering style can be used to determine whether he drew a particular sequence. I was never happy with the rather grotesque faces Graff drew from the 50s on...they tend to distract from the fact that in all other areas he was in top form. He excelled in atmosphere like snowy roads and forests. He really shone when Corrigan took vacation trips to the woods. His loving depiction of lakeside cabins and fishing scenes suggests the subject was close to his heart. And his stories were good, too! Thanks for your insights, Smurfswacker. You and Ger (and others that have come to my attention) are like seasoned scholars trying to paint a picture of the past with incomplete and indirect evidence, only in this case it's comic art history, which has made it very interesting for fans like myself. If I ever do a book like that, I would like to have one story each from all the major Caniff stylists. In some cases the Sunday and daily storylines were seperate, in others not. And in some cases, the Sundays are hard to get (Frank Robbins' Scorchy Smith) and in other cases the dailies elude me (Bruce Gentry). I have been making progress, but it will still be quite an undertaking. On the other hand, I have a title and it will certainly be the definite word on the subject.